In 2006, 2008 and 2010, I was fortunate enough to be part of Alma College’s New Zealand Experience, an 18-day class in New Zealand to take in the sights, sounds, culture and critters. Mark and his coworker, Mel, set up the trip and included opportunities to see royal albatross, yellow-eyed penguins and other critters I’ll probably have to blog about in the future. On my want-to-do list of New Zealand critter encounters was an encounter with a kiwi, a bird that looks like a chubby chicken with puffy legs and a really, really long beak. While kiwis have wing nubbins, they cannot fly, and because they cannot fly, kiwis rely on people for protection, both to preserve their habitat and keep them safe from predators. There are several ways to see kiwis in New Zealand, some of which are easier than others. 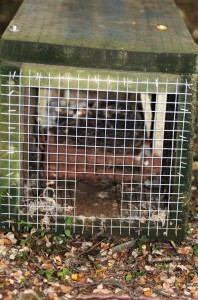 Several towns–including Queenstown and Rotorua–have reserves with kiwis in indoor enclosures. Since some kiwis are nocturnal, most of the indoor enclosures are in the dark as well. Indoor kiwi encounter in Queenstown. The down side of indoor enclosures is the piece of glass between me and the kiwi, because it makes things rather impersonal. And being in the dark, well, it’s hard to take a photograph. 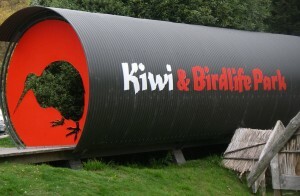 I wanted to see a kiwi up close and in person with no glass between, and I wanted to gets its photo. I looked into kiwi encounters and learned that Stewart Island has more kiwis than people. And it just happened that it was one stop on our Alma College NZ Experience. 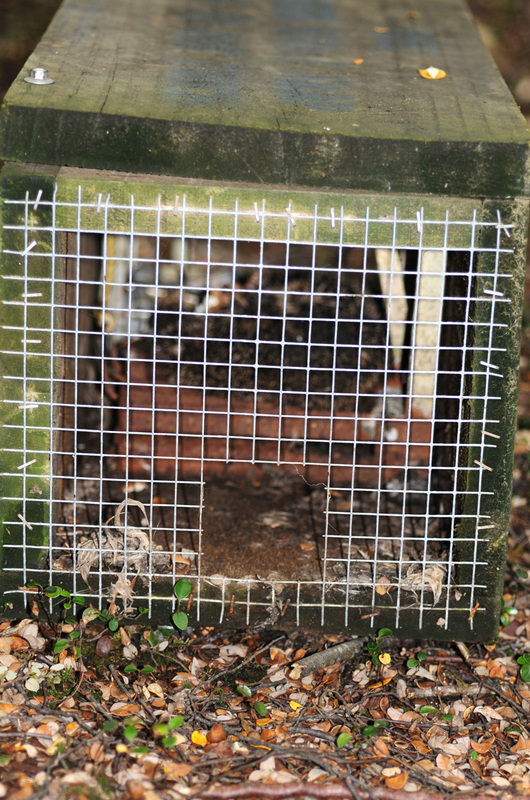 On islands like Stewart Island, New Zealanders have put enough effort into trapping predators that the islands are virtually free of rats, stoats and weasels, all of which eat the kiwis’ eggs. I thought the odds were good I’d see a kiwi on Stewart Island. 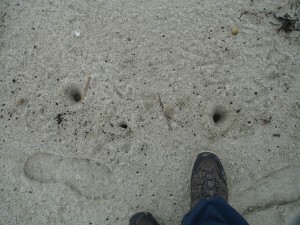 But once I got to Stewart Island I learned that there are several possible ways to see kiwis. One way is to hike around the bush until you stumble on a kiwi. While that worked for one of my co-workers, I know that I could wander for days in the bush only to get lost and return with a weird rash. So Mark and I found another way to potentially find a kiwi near Stewart Island: we hired a water taxi to take us to a small island where kiwis had been seen previously. 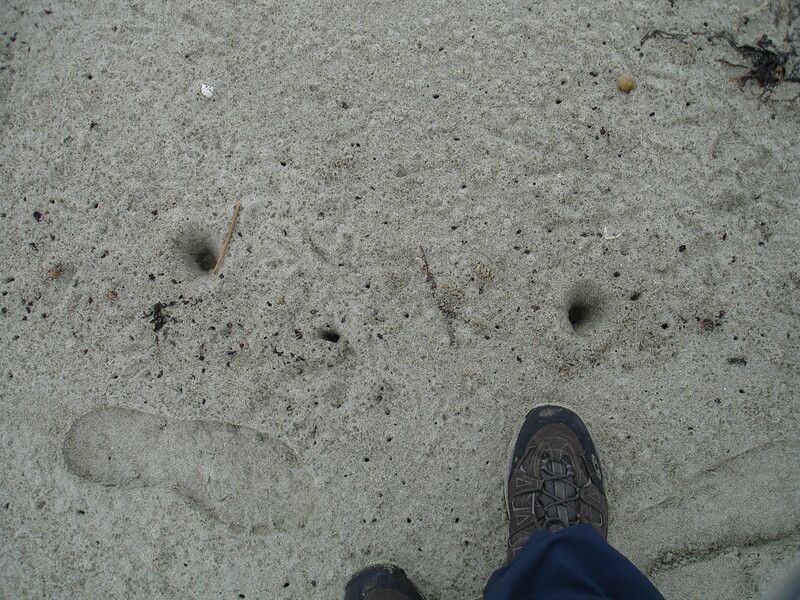 Mark and I did this in 2006 and spent three hours wandering around a beach looking at holes made by kiwis. The holes look like this. Since that didn’t pan out, Mark got in touch with the tour company Alma College used–Travel Time Pacific–which recommended we contact Phillip Smith, a guy with all the right stuff: a boat, the ability to take us to a remote island to look for kiwis at night, and a flashlight. In 2008, Mark, Mel and I, along with a dozen students, met Phillip at a wharf in Stewart Island and jumped onto his boat. The sun set as we rode along, and it was dark by the time we reached a small island. 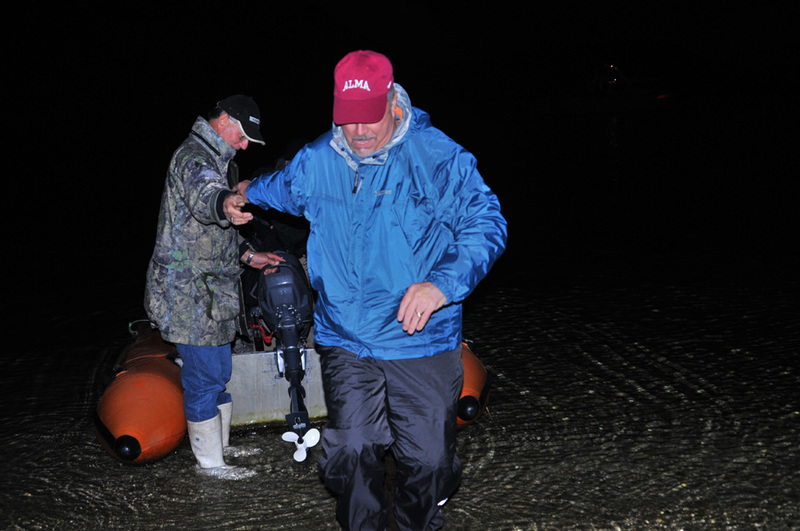 Phillip pulled the boat into shore as close as he dared, dropped a plank and helped us walk ashore. Phillip (left) and Mark on the start of our kiwi spotting adventure. After issuing a few dim flashlights, Phillip led us into the woods, up and down hills and onto a massive sandy beach. The only sound was the sound of the waves and the students “ooh”ing and “aah”ing at the dome of stars overhead. We were on the verge of agreeing where the Southern Cross was when we saw a wave of Phillip’s flashlight. 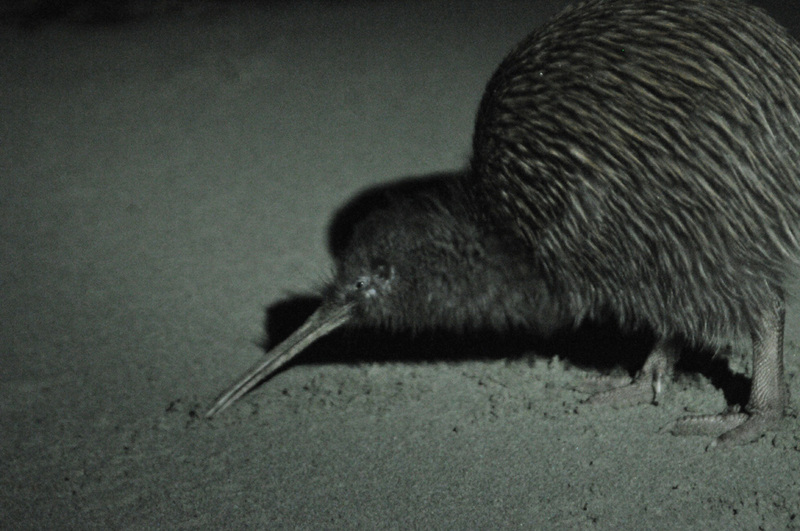 Moments later, in the dim of his light, we saw our first kiwi poking her long bill in the sand, probing around for tiny crustaceans, insects and pretty much anything that wiggled. Kiwis are sensitive to light, which is why only Phillip got to shine his dim “torch” toward the kiwi and why nobody could use flashes or strobes. This photo was taken at the highest ISO my Nikon D100 had, and using a tripod. My first kiwi, near Stewart Island, New Zealand. 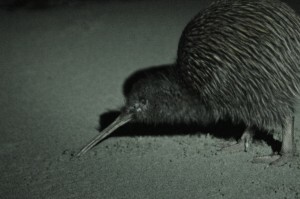 Getting a photograph of my first kiwi encounter in the wild was icing on the cake of what was otherwise a perfect night. A lot of New Zealanders have never seen a kiwi in the wild. During our recent trip to New Zealand, 13 Alma College students followed Phillip into the dark to see their first kiwi in the wild. I couldn’t help but be excited for them–on that huge expanse of beach, under a dome of stars, spending time with a hapless, special bird. 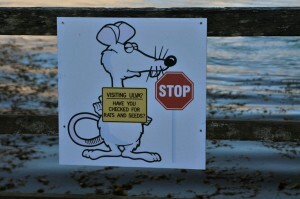 Sign on Ulva Island, off Stewart Island.